Pancreatic pseudocyst is a localized fluid collection that is rich in amylase and other pancreatic enzymes and is surrounded by a wall of fibrous tissue that is not lined by epithelium. Pseudocysts are connected to the pancreatic ductal system, either directly or indirectly through the pancreatic parenchyma. They are caused by pancreatic ductal disruption following increased pancreatic ductal pressure, either due to stenosis, calculi, or protein plugs obstructing the main pancreatic ductal system, or as a result of pancreatic necrosis following an attack of acute pancreatitis. Pseudocysts are a common clinical problem and complicate the course of chronic pancreatitis in 30%–40% of patients but rarely seen in children. We present a case of pancreatic pseudocyst in a 4-year-old child who presented with abdominal swelling and vomiting and whose barium meal as the first radiological investigation raised a very high suspicious of retrogastric masses such as enteric duplication cyst/mesenteric cyst, but ultrasound confirmed it to be a pancreatic pseudocyst. M. S is a 4-year-old male child that came into the pediatric outpatient unit of Aminu Kano Teaching Hospital on account of nonspecific abdominal pain, progressive abdominal swelling, vomiting, and mild fever of 3 days' duration. The patient was treated for plasmodiasis. Three weeks before this presentation, the patient was seen in the same outpatient department with severe abdominal pain; his abdominal ultrasound findings were normal. Barium meal and ultrasound scan were further requested for to rule out gastric outlet obstruction. The barium meal revealed straightened stomach making the distal esophagus to lie horizontally. 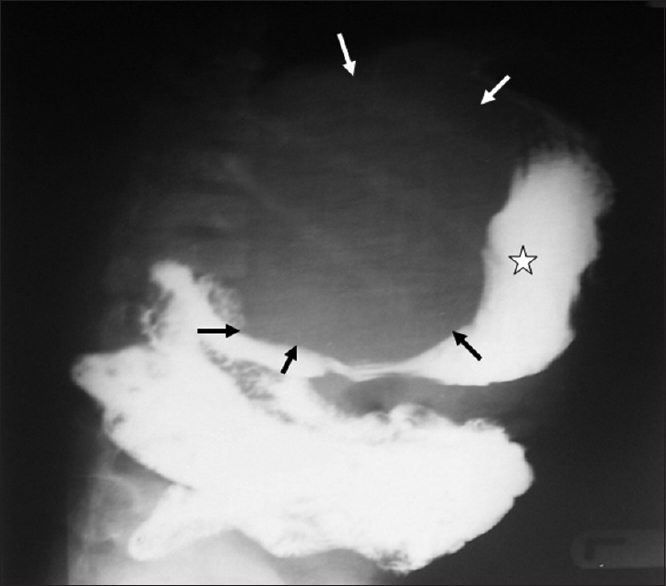 The stomach was displaced anterosuperiorly with widening of the retrogastric space [Figure 1]. The ultrasound scan findings revealed a huge well-defined smoothly marginated sonolucent mass lesion in the epigastrium containing fluid with low-level mobile echoes, displacing the right kidney laterally and bowel loops inferiorly [Figure 2]. The pancreas has normal echo pattern being slightly more echogenic than the liver. The cyst is however seen to continue with the neck of the pancreas with mild dilatation of the common bile duct measuring 9 mm suggestive of biliary obstruction. Laboratory investigation revealed normal packed cell volume, full blood count, and electrolytes and urea. The surgical drainage of the cyst was then done which revealed straw-colored serous fluid that contains enzymes with dead red blood cells and inflammatory cells on chemistry and cytological laboratory results. Edino et al. in their study carried out in this same institution say that pseudocyst is an uncommon disorder in Nigeria; this may probably be due to underreporting in the absence of modern abdominal imaging facilities in our subregion. The incidence of pseudocyst is low irrespective of the etiology being 1.6%–4.5% and even lower in children. Three weeks before this patient presentation with pseudocyst, he was seen in the outpatient department with severe abdominal pain. His ultrasound findings were however normal. This even though unconfirmed raised the possibility of acute pancreatitis whose diagnoses were missed on ultrasound. Although direct causal relationship cannot be confirmed in our patient, the retrospective diagnosis of acute pancreatitis was most probably missed in the initial ultrasound scan. Imrie et al. reported that pseudocysts developed after emergency hospital admission for an episode of acute pancreatitis in 86 patients out of 879 cases of acute pancreatitis. This resulted in a 7% overall incidence of pseudocysts as a complication of acute pancreatitis. In a series of 926 patients with nonalcoholic acute pancreatitis, fluid collections were observed in 83 (9%). At the end of 6 weeks, 48 (5%) still had a fluid collection consistent with a pseudocyst. Similarly, Kourtesis et al. followed prospectively 128 consecutive patients with acute pancreatitis with computed tomography (CT). Forty-eight patients (37%) developed fluid collection in the pancreatic region. The majority of these resolved spontaneously. In 15 (12%) patients, symptomatic pseudocysts developed. However, pseudocysts tend to be more common in chronic as compared to acute pancreatitis. Incidence figures of 30% to 40% have been reported in the literature. The pathogenesis of pseudocysts seems to stem from disruptions of the pancreatic duct due to pancreatitis or trauma followed by extravasation of pancreatic secretions. Two-thirds of patients with pseudocysts have demonstrable connections between the cyst and the pancreatic duct. In the other third, an inflammatory reaction most likely sealed the connection so that it is not demonstrable. The index is presumed to have had acute pancreatitis which might have cause the disruption of the pancreatic duct or blockage by a protein plug, calculus, or localized fibrosis. The presentation clinically ranges from asymptomatic patient to major abdominal catastrophe due to complications. Acute complications include bleeding (usually from splenic artery pseudoaneurysm), infection, and rupture. Chronic complications of pancreatic pseudocyst aside from gastric outlet obstruction include biliary obstruction and thrombosis of the splenic or portal vein with development of gastric varices. Others include persistent abdominal pain, anorexia, or abdominal mass after a case of pancreatitis. Rarely, patients present with jaundice or sepsis from an infected pseudocyst. Occasionally, even patients with large pancreatic pseudocyst are asymptomatic. In patients presenting with pancreatic cyst incidentally discovered on imaging, a crucial point is to define whether the patient has had prior history of pancreatitis. This patient presented with features of gastric outlet obstruction from the mass effect by the cyst which includes vomiting after feed with abdominal pain and swelling 3 weeks after he had severe abdominal pain which most likely was as a result of acute pancreatitis. The sensitivity of findings on physical examination is limited. Patients frequently have a tender abdomen. They can occasionally have a palpable abdominal mass. Peritoneal signs suggest rupture of the cyst or infection. Other possible findings include fever, scleral icterus, or pleural effusion. In these patients, physical examinations were unremarkable. Sonographic appearance of pseudocyst includes anechoic mass with distal acoustic enhancement. It has a smooth wall with low-level mobile internal echoes. Usually, this appearance results from the presence of necrotic debris and is more common in pseudocysts that form as a result of acute necrotizing pancreatitis than in chronic pancreatitis-related pseudocysts just as it most probably happened in this case. The pseudocyst can appear more complex in two other instances: when hemorrhage occurs into the cyst or when infection of the cyst complicates the clinical course. Color Doppler ultrasonography is often times performed to rule out a giant pseudoaneurysm. 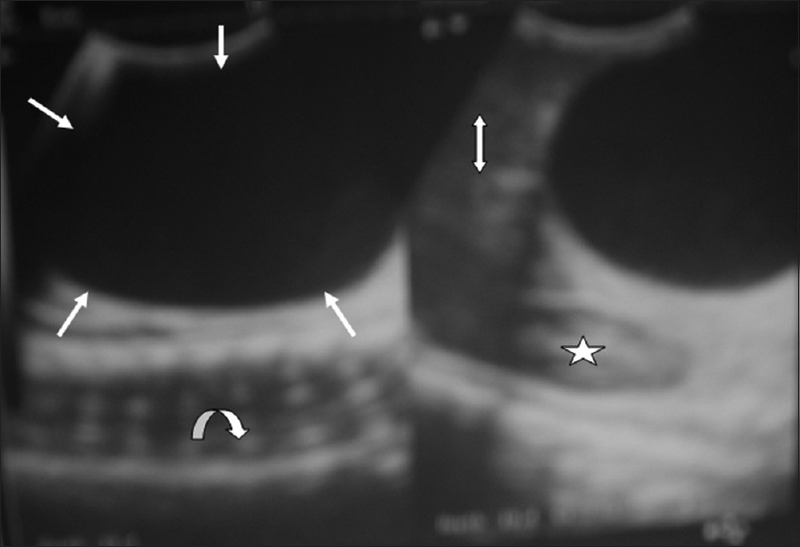 Sensitivity rates for ultrasound in the detection of pancreatic pseudocysts are 75%–90%. CT was not done in this case because the managing surgeon was satisfied with the diagnosis based on ultrasonography and barium meal, and because of cost to the patient, it however has a sensitivity of 90%–100%. The identification of a thick-walled, rounded, hypodense fluid-filled mass adjacent to the pancreas on an abdominal CT scan in a patient with a history of acute or chronic pancreatitis is virtually pathognomonic for pancreatic pseudocyst. Magnetic resonance imaging or magnetic resonance cholangiopancreatography is superior to CT in depicting debris within fluid collections and pseudocysts. On T2-weighted images, a fluid-filled cystic mass produces high-signal intensity and appears bright. The pancreatic duct and biliary systems are easily visualized in detail although interpreting the status of pancreatic duct integrity may be difficult. For small uncomplicated pseudocyst, medical management is usually the choice where patients are given intravenous fluids, analgesics, and antiemetics. For patients that can tolerate oral intake, low-fat diet is recommended. In patients that cannot tolerate oral nutrition, support can be provided through nasoenteral feeding or total parenteral nutrition. Symptomatic pseudocysts due to complications such as rupture, hemorrhage, formation of pseudoaneurysm, infection, and gastric or intestinal obstruction are seen just like in the index case who presented with partial gastric outlet obstruction. These complications are indications for drainage procedure. The available options are percutaneous, surgical, and endoscopic drainage approaches. Surgical drainage of the pseudocysts was performed for this patient and was accomplished by doing a laparotomy and providing a communication between the pseudocyst cavity and the duodenum. The surgical stoma was placed in the most dependent portion of the cystic cavity in order to maximize the chances of complete drainage. The patient recovered fully with no reoccurrence or further complication. The authors certify that they have obtained all appropriate patient consent forms. In the form dated 21st August 2017, the patient's father has given his consent for his son's consent for his/her/their images and other clinical information to be reported in the journal. The patients understand that their names and initials will not be published and due efforts will be made to conceal their identity, but anonymity cannot be guaranteed. Bradley EL 3rd. A clinically based classification system for acute pancreatitis. Summary of the International Symposium on Acute Pancreatitis, Atlanta, Ga, September 11 through 13, 1992. Arch Surg 1993;128:586-90. Gumaste VV, Pitchumoni CS. Pancreatic pseudocyst. Gastroenterologist 1996;4:33-43. Taha AM, Klippel C. Pediatric pancreatic pseudocyst associated with cholelithiasis. J Natl Med Assoc 1986;78:887-91. Edino ST, Yakubu AA. Experience with surgical drainage of pancreatic pseudocyst. J Nat Med Assoc 2006;98:1945-848. Mabogunje OA, Lawrie JH. Surgery for chronic pancreatitis in Zaria, Nigeria. World J Surg 1990;14:45-7. Imrie CW, Buist LJ, Shearer MG. Importance of cause in the outcome of pancreatic pseudocysts. Am J Surg 1988;156:159-62. Pitchumoni CS, Agarwal N. Pancreatic pseudocysts. When and how should drainage be performed? Gastroenterol Clin North Am 1999;28:615-39. Kourtesis G, Wilson SE, Williams RA. The clinical significance of fluid collections in acute pancreatitis. Am Surg 1990;56:796-9. Grace PA, Williamson RC. Modern management of pancreatic pseudocysts. Br J Surg 1993;80:573-81. Janet M, Richard WW, Andrew RW, Philip JA, Paul AD. Pancreas. In: Sutton D, editor. Text Book of Radiology and Imaging. 7th ed. London: Churchill Livingstone; 2003. p. 788-824. Wolfgang D. Liver, bile ducts, pancreas and spleen. In: Radiology Review Manual. 6th ed. Baltimore: Lippincott Williams and Wilkins; 2007. p. 667-741.